God looked at everything he had made, and he found it very good (Genesis 1:31). Life is full of contradiction, and so are attempts to understand where life came from, why we are here, and what will become of us. An old English proverb proclaims: There but for the grace of God go I. The proverb sums up the randomness of the universe—the order-out-of-chaos, the utter, unexplained, and unaccounted for contingency of life itself—as a matter of Divine will. Some have interpreted this idea darkly, as for example the Reverend Jonathan Edwards, whose God is angry and holds sinners over the pit of hell “much as one holds a spider, or some loathsome insect over the fire.” For Edwards, only God’s “pleasure” or “arbitrary will” stood in the way of eternal suffering, and the sinner “hang[s] by a slender thread, with the flames of divine wrath flashing about it …” Lions and tigers and bears seem meek by comparison—oh my. For those who dwell on the goodness of the Earth, however, life as a gift of grace is a liberating thought, providing the freedom to leave other-worldly issues alone. Instead, one’s gaze turns to the things that matter in this world, and in this moment a new kind of human freedom is born. The world beyond this one is indeed arbitrary and unknowable, but in this world what we do matters. Here we, not God, are responsible. This notion of contingency, of the arbitrary nature of causality in the universe, isn’t a terribly God-bound thought. The grace of God in the proverb can be understood in quite godless terms as the general force of randomness as it functions in the entropy of the universe. Either way, life is contingent on a lot of things that are completely out of our control, and in that contingency, ironically, good and evil are placed in human hands and human hands alone. A couple months ago, I had a party. I’d moved into a new apartment and wanted to share the space with some friends. We prepared for the party all day, cleaning house and eventually going out to buy some good cheese, wine, bread, the makings of spinach salad, and such. Along the way, my girlfriend bought a dozen yellow roses. 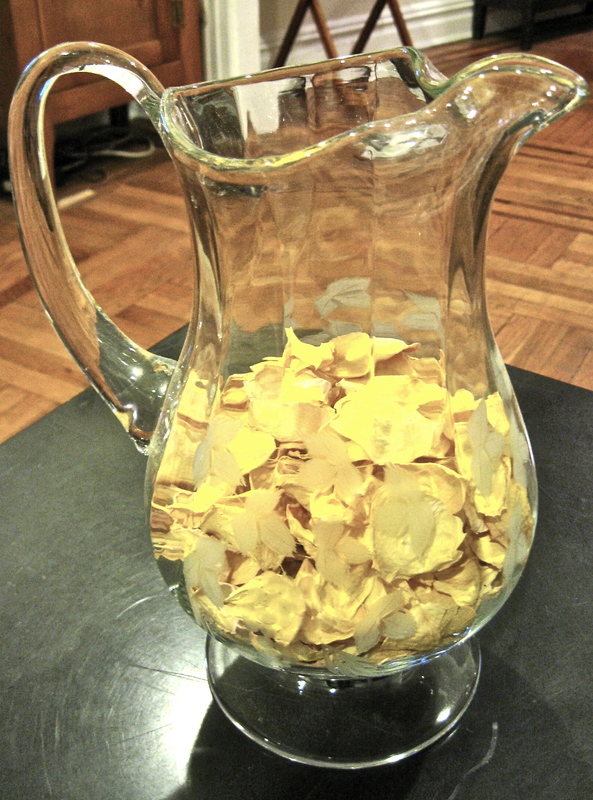 After the party, once the roses had dried, I took the petals from the stems and placed them in a bowl. I had hoped they would smell like roses and I would crush them to place them in a bowl as potpourri. Alas, they never smelled so good, but the yellow petals were very pretty and I put them in the pitcher, which sits on the window sill and now adds a dash of yellow to the room. 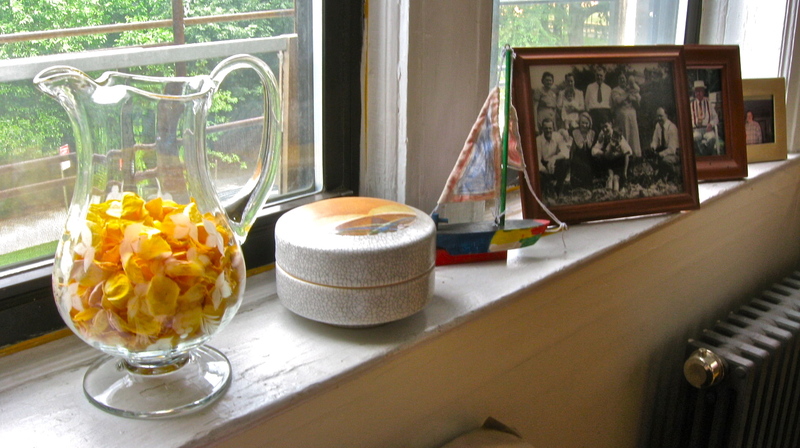 On this window sill in my living room, I keep a number of things. There is a ceramic covered bowl that I bought in 1989 the first time I ever went to the Ann Arbor Art Fair. It was made by Rob Wiedmaier, who worked out of St. Joseph, Missouri. Next to that is a little wooden toy sailboat that my son made from a kit he received in the gift bag at another boy’s birthday party. And then there are three photographs of my family. 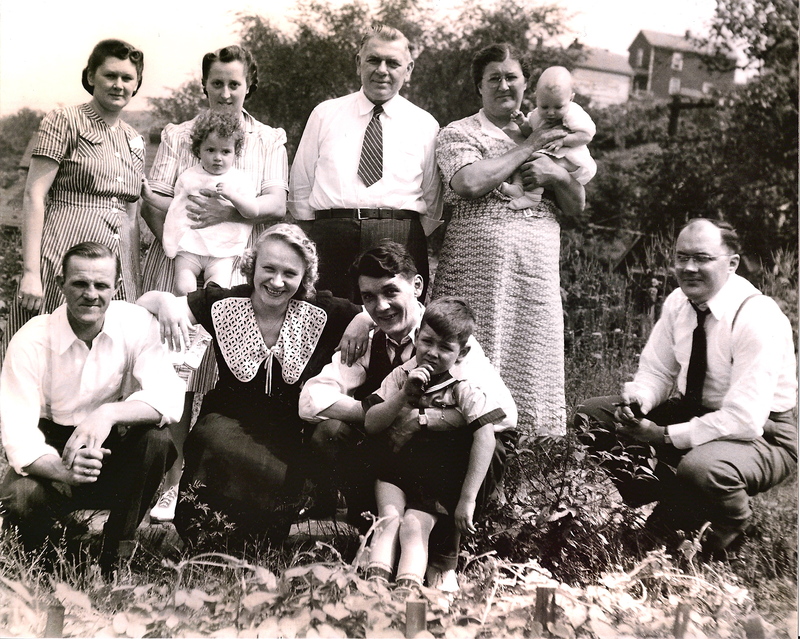 In the first photograph, we have the Krupas, from about 1941 or so. The patriach, great-grandpa Krupa, stands in the center. His three children are there—Joe, Johnny, and Annie. Joe was my grandfather, who my brother and I called “Buddy-Buddy,” because he that’s what he was, our buddy. Next to great-grandpa Krupa is my grandmother, Joe’s wife, Mary Niznik. She’s is holding my mother, Mary, who is about one year old in this photo, looking bright with her Shirley Temple curls. These were good Slovak people from the hills of the Monongahela Valley in western Pennsylvania. Buddy-Buddy was a steelworker. After he died in 1969, my grandmother came to live with us, and for the next seven years, she was the most wonderful storyteller, babysitter, friend, and ally my brother and I ever had. She made stuffed cabbage roles, she ground her own meat, and she made the Easter Bread every year, just like in the old country, which she called “Austria-Hungary.” I took Joseph as my confirmation name in the memory of my Buddy-Buddy. My brother named his son Joseph. The next photo over is of my other grandfather, Ernest John Guidry, III. In the photo he is old, in his mid-70s, sitting in his back yard decked out for Mardi Gras. My brother and I never called him “grandpa.” We always called him “Grumpy,” a nickname that my mother gave him because he was always so jolly and full of life. He had 17 grandchildren, and he called each and every one of us “Peanut.” When this photo was taken, he had recently been diagnosed with Parkinson’s Disease. He died within a year or two of the diagnosis, thankfully, we all felt. In the final photo, half hidden behind the rest on the window sill, are my mother and father. They were photographed in the den/living room of their house in River Ridge, Louisiana, the house where I grew up. I remember the first time I saw the place. It was in 1973, late summer. Mom took my brother and I there—we were all of 8 and 9—and there wasn’t much of a house. Just a slab of concrete on a sand lot with lots of trees all around. There were only four houses on the street. A couple months later, there was a house on our slab, and we moved. Such it was in the 70s. My father still lives there. Such is life, with no reason to be and no reason to end, but every reason for the living to live. Do not ask, but live. Run the race you are given. Be simple and don’t strive. Be like the flowers of the field. The photographs of the pitcher, the window sill, and the lily were taken by author. The window sill was photographed as it appears in my living room. Behind it, through the window, is the Bowling Green of the Prospect Park Parade Grounds in Brooklyn, which has been the photographic subject of a few postings so far. The lily grows in my apartment building’s garden next to the sidewalk. The garden isn’t kept or tended very well. It mainly just grows there, though I do see Bart’s mother, the landlord, sweeping and cleaning and watering from time to time. 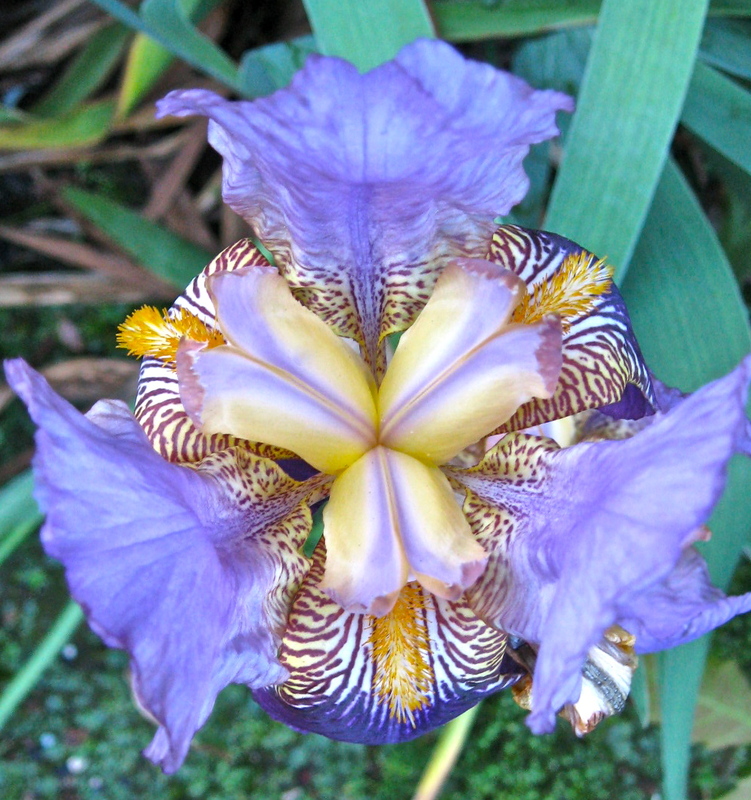 I saw the flower when returning home from a run in the park with my son. Of all the people in the photographs, only one is still alive, my father. He is 70 years-old now, in quite robust health, and determined to reach 100. His odds are better than average. His father, who was pictured as described, died at 77, quite young for our family. My father’s mother died at 91. His grandmother, EJ’s mother, died at 101 or 102. The rest of our aunts and uncles are in their 80s and 90s. My odds, on the other hand, are something of a split decision, for my mother’s side of the family—the Krupas and Nizniks—mainly seem to die in their 50s and 60s. Mom was 67 when she died, like her mother, who made the cabbage rolls and the Easter Bread. Buddy-Buddy was about 58 when he passed on. There but for the grace of God go any one of us, on any given day, at any given age. For the record, my son and his cousins call my father “Grandpa,” because that’s what he is. Selma, After reading your comment I told my girlfriend what you wrote – such a fine compliment – it made me beaming and happy. Thank you very much for the affirmation. Grumpy did call his grandkids Peanut. He was actually kind of a funny guy to us. But he was a hard man to have as a father. Hard, but in the end a good, good man, who helped raise most of his nieces and nephews and who helped settle a lot of Cambodian and Vietnamese migrants in New Orleans. 400 people came to his funeral mass. I tell a little more about him in my Glass of oil post. I miss my grandparents a lot but am so thankful I could be that close to them.